Home » Soup Recipes » Grandma’s Potato Soup Recipe– sometimes there is nothing better than a steaming hot pot of soup. Grandma’s Potato Soup Recipe– sometimes there is nothing better than a steaming hot pot of soup. Grandma’s potato soup recipe is so comforting and perfect when you are trying to capture some of those familiar feelings of childhood. In about 45 minutes you can have the best bowl of potato soup your spoon can sink into! Homemade potato soup is so comforting and perfect when you are trying to capture some of those familiar feelings of childhood. 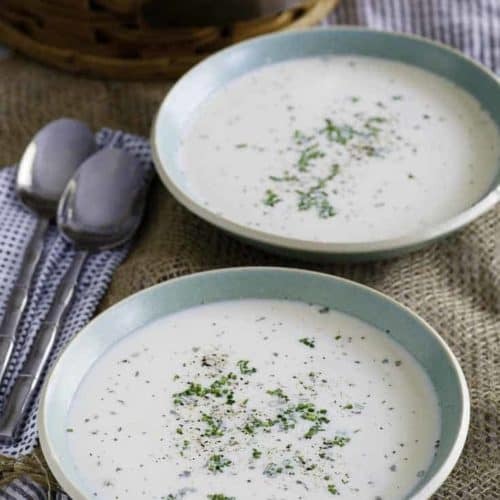 In fact, some recipes are so nostalgic that you just need to have them – and this old fashioned potato soup recipe is definitely one of them. 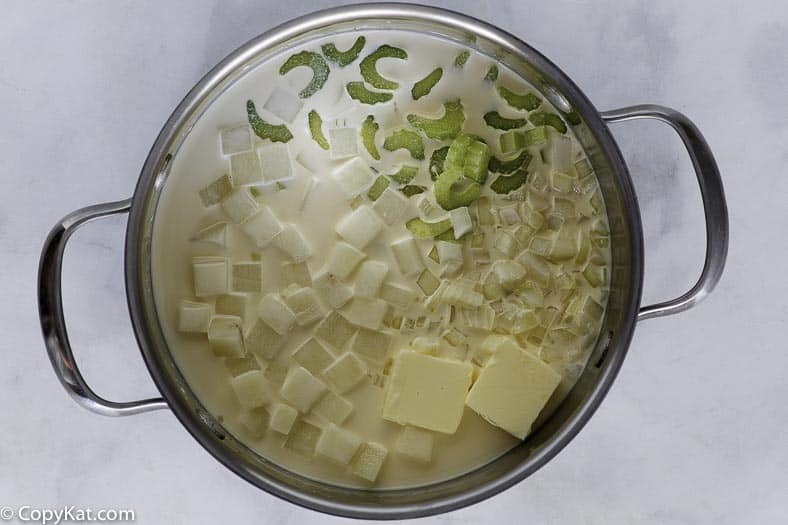 Potatoes, milk, and other fresh vegetables make for a delightful pot of soup. Some potatoes aren’t good for making potato soup. It’s a fact that all potatoes are not created equal, and some kinds of potatoes can turn your soup into a thick, gluey mass. My grandmother used Idaho or russet potatoes, and she definitely knew best. It was a tradition when feeding a group of people to allow one potato per person plus one for the pot. It meant that you had enough food but not too much. You prepare the “pot” potato along with the other potatoes. This recipe uses garlic juice, but you can substitute chopped or pressed garlic. Garlic juice is reputed to have many health benefits, and you can even make your own. Click here to see how. While researching how to make garlic juice, I came across a gadget called a garlic peeler that makes it very easy to peel garlic. Click here to learn more. Throw in a couple of bay leaves and sprinkle some fresh chives on top. Use green onions instead of regular onions. Add a bit of salty taste with some bacon bits. Sprinkle some Kraft Three Cheese Blend on top. Grandma’s Potato Soup is the perfect way to warm up! 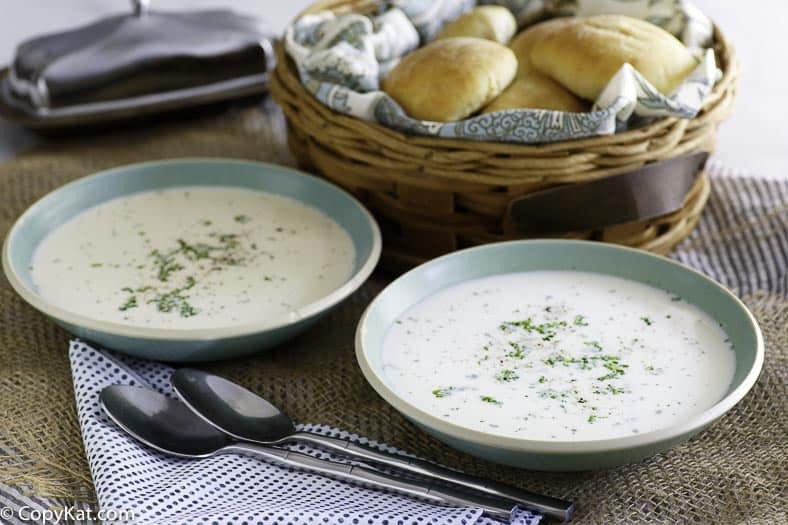 There is simply nothing as good as a delicious bowl of homemade potato soup. Potato soup is easy to make, and perfect for the beginner and the experienced cook alike. Before you make this amazing bowl of soup be sure to leave me a comment down below and share the best dish your grandmother made for you! Sometimes there is nothing better than a bowl of homemade potato soup. Peel and chop potatoes into bite-sized chunks and place into a medium-sized stockpot. Add evaporated milk and fill up empty can with each whole milk and water. Add butter, allow to melt. Add chopped celery, onion, chopped garlic, sea salt, and pepper. Cook on low or simmer until potatoes are soft. DO NOT allow soup to boil. The flavor of potato soup is enhanced by any buttered sweet roll or dinner roll. If desired top with fresh or dried herbs, cheese, crumbled cooked bacon. 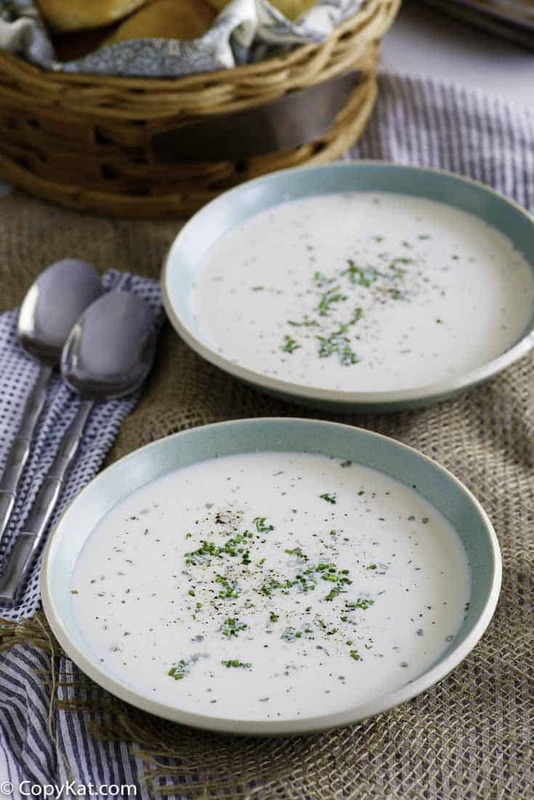 Serve potato soup cold during the summer! Vichyssoise is cold potato soup! Do not use potatoes that have a green tinge to them, they are past their prime! The soup is best consumed 2 or 3 days after it is made! 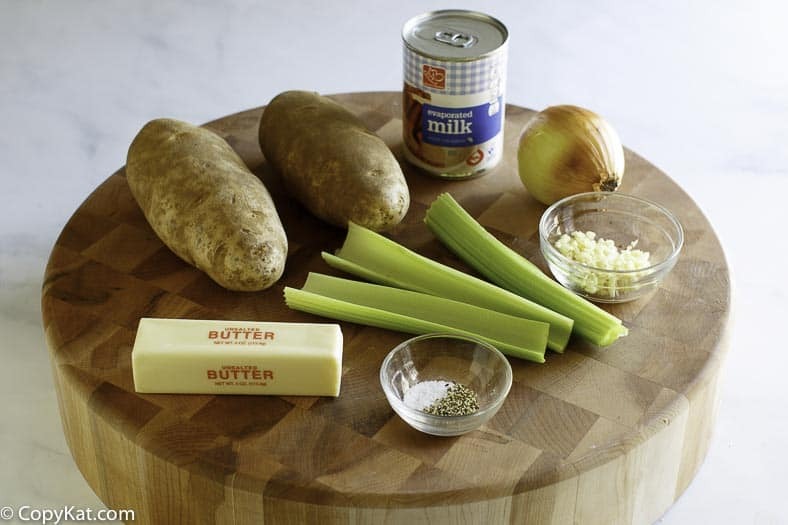 This potato soup is made with evaporated milk and many thanks go to hyjinx for sharing the recipe. Love Potato Soup? Here are more copycat potato soup recipes for you to try. I was so happy when I found this! My Mom passed and I had no idea how to make her potato soup. I just knew what she used but not how much etc. I’ve made this a couple times now and the only things I do different is add fresh chives on top and throw a couple bay leaves in the pot, it is an exact replica of hers, it is so good and its a great comfort food for me! Thank you so very much for posting!! I am so glad that you enjoyed this one. There are some recipes that are so nostalgic that you just have to have. Garlic juice?? Never heard of it. Do u mean diced garlic? Some places sell garlic juice. You can substitute for chopped garlic, I would add about a teaspoon or more depending upon your personnel preference. I cooked this soup tonight! My husband just had stomach surgery so can only eat liquids at this point. I would like to know the calorie content, if available. Very good soup! Well let me share my experience with this soup. In a nutshell I put all the ingredients in the pot. Cooked at high until the mixture started to get hot and them changed to low and let it cook for a while (around 60 minutes). The whole potato in the pot works to help you to know when the soup is ready. When the whole potato is soft and breaks apart the soup is ready to eat. I added some bacon bits to it. I have to add some salt to taste in my bowl and a sprinkle of Kraft Three Cheese Blend on top. It tasted good. I live alone and was saving some of the soup when I noted a layer of oil on top of the tupperware. This is definitely not a low fat food. How long does it normally take to get the potatoes soft? Is this something that can sit all day or only an hour? if it helps, that’s how all the women in my family – mom plus aunt, plus grandmas on both sides – calculated how many potatoes for soup or mashed. You counted the number of people you were serving, assigned one potato each, “plus one for the pot;” i.e. just a smidgen more to make sure you had enough but not too much. You don’t put it in whole, it’s prepared along with the other potatoes. it’s just an aid to figuring out how much to make. For instance, I have three people coming for dinner, plus myself and my spouse. That’s five people, so I’d fix mashed potatoes with six potatoes – one for each of the five people eating plus one for the pot. I assume the onion goes in with the rest of the celery, garlic juice salt and pepper? I’m still confused about the 1 potato for the pot? what kind of potatos, some soak up juice and get grainy and break down. What a wonderful question, you are so right some potatoes aren’t good for making potato soup with. My grandmother used idaho or russet potatoes. I’ll be sure to update the recipe! What is the purpose of one whole potato in the pot? Just curious because it never gave any instructions on when to put it in the pot.